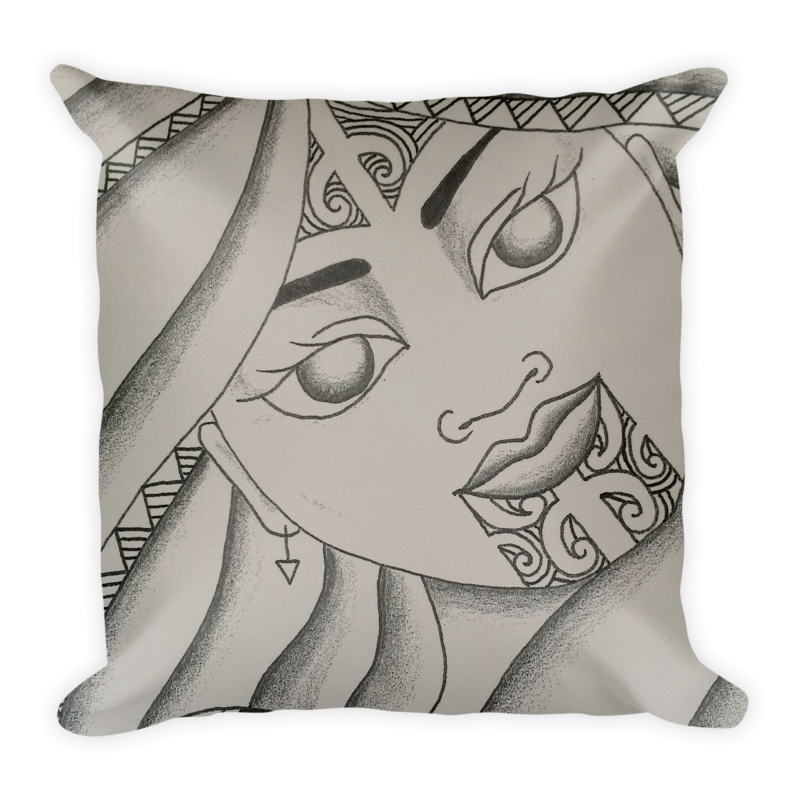 Art, fashion and homeware designed by indigenous New Zealand Māori artist Taryn Beri of the Ngāti Toa, Te Atiawa and Ngāti Raukawa tribes. Featuring the 'ALL ONE UNDER THE SUN' design, based on an original painting. These collectable throw pillows are designed to be miniature works of art in themselves and are much more versatile than a static canvas hanging on the wall! Move them around from your bedroom to your lounge and change up your living spaces whenever you feel like it. These collectable throw pillows make great statement art pieces in your home, they can be used as meditation pillows, and they also make great gifts. 46cm (18 inches) by 46cm (18 inches) in size. Includes the pillow inside. Featuring the ‘PUANGA’ star design based on an original painting that was completed in Alexander in the South Island of New Zealand. This design refers to the interconnectedness of all things - stars, humans, birds and the entire natural world. The central eye of the design represents one of the eyes of the Sky Father, Ranginui watching over his descendants. Puanga (Rigel) is a significant star to many tribes here in Aotearoa, New Zealand. Some people believe that certain stars act as gateways or portals to other worlds, dimensions and levels of consciousness. The stars also play a major role in traditional Māori navigation techniques. $150NZD EACH including packaging and postage worldwide. Featuring the ‘MOEMOEA’ design based on an original painting. Featuring the 'MATA ARIKI’ design depicting the Matariki (Pleiades) star constellation, based on an original painting by the artist that was completed in Alexander in the South Island of New Zealand. The Matariki star cluster is significant to many cultures throughout the world and has many different names and stories associated with it. In this design, the stars of Matariki are painted as stylized eyes in the night sky - the eyes of our ancestors and loved ones that have passed on, watching over us. Featuring the 'POUTAMA' design, based on an original painting. Featuring the 'BELIEVE IN YOURSELF' design based on an original painting. Black, white and gold in color. The original painting was completed in Perth, Australia. "This design represents the ancestors and genealogy that is always present within the DNA, blood and bones of a person - whakapapa that is able to be accessed at any time. This design is a reminder of all of the people that came before you and contributed to make you who you are today. This design reminds us that we descend from greatness and that we too have the capacity and capability for greatness - just as our ancestors did. It also refers to our own descendants and the continuum of genealogy that connects us all, past, present and future. Your ancestors believe in you - so believe in yourself! I created this painting at a difficult time in my life when I was living in Perth, Australia alone and isolated from my family and friends. I didn't know many people in that place at the time and I was lonely and struggling financially, emotionally, and spiritually. I painted the message of 'believe in yourself' as a personal affirmation that was necessary for me at the time to survive, keep moving forward and to help me get on and do what I needed to do." Featuring the 'DIVINE ORIGINS II' design, based on an original painting. Featuring the 'PSYCHEDELIC KOWHAIWHAI' design. Featuring the 'ANCIENT WISDOM' design, based on an original painting. Featuring the 'HINE' design based on an original black and white drawing that was completed in Auckland, New Zealand. This design is a tribute to the 'ira wahine' and refers to a special and divine feminine essence. The young woman in the drawing represents a 'puhi' or special young female in full ownership of her personal and spiritual power. These collectable throw pillows are designed to be miniature works of art in themselves and are much more versatile than a static canvas hanging on the wall! Move them around from your bedroom to your lounge and change up your living spaces whenever you feel like it. Because this design features a FACE on it, it is not for sitting on, but for resting your head on. Featuring the 'DIVINE ORIGINS BLUE' design based on an original black and white drawing that was completed in Auckland, New Zealand. Featuring the 'MAWHERO DREAMING' design. INVEST IN THE ENTIRE COLLECTION OF 12 THROW PILLOWS BY TARYN BERI. All pillows are 46cm (18 inches) by 46cm (18 inches) in size. Includes the pillows inside. $1500NZD FOR THE COLLECTION OF TWELVE throw pillows, including packaging and postage worldwide.